The Florida Commission on Ethics has released a report and materials relating to complaints made against former Tallahassee mayor Andrew Gillum. The materials include an audio file of the executive session where board members discussed claims that Gillum had accepted gifts from lobbyists including tickets to the Broadway show Hamilton along with accommodations on a trip to Costa Rica. Elizabeth Miller is the advocate for the commission—she presented facts about the case at the board’s recent meeting and issued a recommendation. “I’m asking that you find probable cause on allegations 1,2,3,5 and 6. I’m asking for no probable cause on allegation 4. It’s a solicitation allegation. And I don’t believe there’s proof he solicited,” Miller said. Gillum’s lawyer Barry Richard says much of the evidence in the case is based on an affidavit from Adam Corey—a former friend of Gillum and a lobbyist. But Richard questions Corey’s motives. “He told the accountant that this whole trip was to be put down as a client development retreat by his company. There is nothing in this record that supports that. What everything supports is that this is a social trip and that tells you why Mr. Corey has incentive to do just one thing. He woudn’t testify. He wouldn’t submit to an interview, but he voluntarily submitted an affidavit that said Mr. Gillum never paid me. Well, he had to say that if he was deducting this in his income tax as an expense,” Richard said. Much of the discussion focused on whether Gillum had stopped for lunch on his way from the airport during the Costa Rica trip. Richard says its clear Gillum did not. And he says photos provided by Gillum’s wife, R. Jai, support that. “The photographs are of Mr. and Mrs. Gillum standing in front of a small plane before they took off from San Jose to the small town where this house was located. The photographs were time-stamped. The first one was 3:05 p.m. The third one was 3:09 p.m. The flight was about 30 or 40 minutes. And then they had to drive to the location. One thing that is crystal clear here is that Mr. Gillum had no lunch at the Run Away grill to talk about city business or anything else,” Richard said. But some argued the time linked to the photo likely reflected the time in Tallahassee rather than Costa Rica—giving Gillum a potential opportunity to stop for lunch. Commissioner Garrett Richter says that held a lot of weight for him. “That whole timeline and the time change and the discrepancy and the we got to the hotel at 4:00. It sounds to me like they got to the hotel after lunch,” Richter said. Commissioners found probable cause in the five accusations recommended by ethics advocate Elizabeth Miller. An evidentiary hearing comes next. The ethics allegations combined with an ongoing investigation into corruption at Tallahassee’s city hall played a significant role during Gillum’s failed 2018 bid for governor. 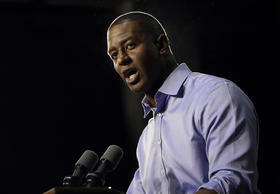 But Tuesday Gillum announced a he’s taking a new job with CNN as a political correspondent.